A glass paperweight and the plate die that was used to make it. A set of three paperweights were made on the occasion of the final design approval for the Continuous Electron Beam Accelerator Facility. In a lab where every detail could be historically relevant, the Jefferson Lab History Archives Program captures the past for future audiences. If you find yourself with a question about the origins, building, development or history of Jefferson Lab, the Jefferson Lab History Archives Program may be the resource you need. The program collects, categorizes and protects decades of institutional knowledge, artifacts, transcripts and images for future generations. “From the time the need for such a laboratory was identified, through early construction and development, until now, the lab has had an interesting history,” Kim Edwards, Scientific and Technical Information Manager said. The Jefferson Lab History Archives Program began in 2012, when Larry Cardman, a long-time physicist and Scientist Emeritus, was approaching retirement. Cardman initiated the Jefferson Lab History Task Force with the goal to evaluate, preserve and catalog important knowledge and teamwork that built and developed Jefferson Lab into the research force it is today. Of course, creating an archives program is not as simple as saying, “Here is a set of documents and records that are historically significant,” explained Edwards. Systems, policies and processes must be created and set into place for evaluating sources of material, controlling access terms, appraising and identifying projects and collecting relevant material. Edwards threw herself into the program with a determination to succeed. She researched other programs, met with Catherine Westfall, an accomplished historian who had produced a document on the founding of the lab. She also visited Fermilab and met with its History and Archives staff. The goal was to work out the logistics of establishing a quality archives program. In September 2014, Edwards’ efforts paid off: She capitalized on a $10,000 grant she had received from the American Institute of Physics to kick-start the budding program. The grant was made for archiving important scientific knowledge, and the lab matched the funds. With that seed money, Edwards was able to hire a part-time archivist. Today, the program consists of a two-person team, Kim Edwards and part-time Processing Archivist Melissa Erlandson. In addition, Kaydee Moore, Jefferson Lab’s Site Manager for Epiq Global Copy Services, assists in preparing and digitizing documents. “We have come a long way in the last few years,” Edwards said. What started as a number of boxes of paper inherited from the Director's Office of Hermann Grunder has now grown into over a million pieces of paper, half a million photographs and various items holding the answers to questions regarding Jefferson Lab’s conception, development and work. What has also grown are the systems, policies and processes to manage the lab’s documented history, which include determining what to keep and what to throw away, removing staples and rubber bands, and then preserving the paper documents in acid-free folders tucked away in acid-free boxes. The archives include oral interviews, physical items, audio files, transcripts, documents, Jefferson Lab-designed posters, and even the Hammer Award that was presented to the lab by Vice President Al Gore. 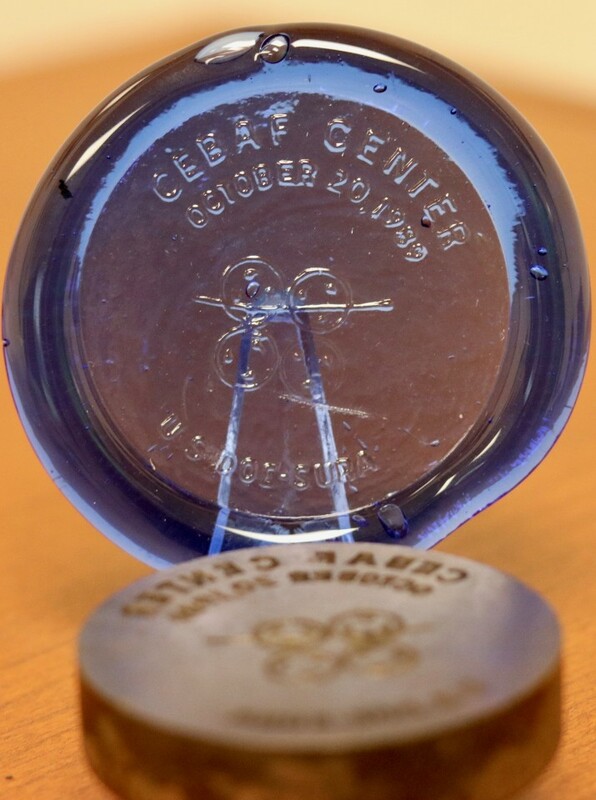 “The most unique items in the archives, I think, are three original plates for glass paperweights made for CEBAF by the Jamestown Glasshouse. The paperweights were made in commemoration of final design approval,” Edwards said. The plates are preserved along with a detailed description and documentation of the process used to make them, which was researched and prepared by Erlandson. Future plans for the program include finding and applying for grant funding to purchase a document management system to streamline the categorizing of items, to add the ability to search the collections, and to allow for attaching permissions to documents. Edwards and Erlandson are excited for the possibility of elevating the archives program with these user-friendly features. To access the treasure trove of items preserved by Jefferson Lab’s History Archives Program, visit the Archives webpage at www.jlab.org/ir/archives/. The Finding Aids there will help you focus your search. While the program has already amassed and preserved an impressive collection, Edwards says that she is always on the lookout for items to add. Members of the Jefferson Lab community may contact Kim Edwards or Melissa Erlandson to provide documents, T-shirts or other items for review. “We are always glad to consider historical materials for our archives,” Edwards said.